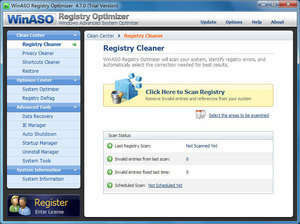 WinASO's Registry Optimizer is a fully featured Windows Registry cleaner which turns your slow-running PC into something much more acceptable. It cleans trash from your registry and remvoes obsolete and redundant keys from your registry which seriously improves the performance of your computer. WinASO Registry Optimizer is also good at helping resolve errors surrounding the "blue screen of death", ActiveX and "unable to load DLL" errors, unknown or unexplained errors occuring because of invalid registry keys and more. Moreover, this registry cleaner is suggested for further system errors resulting from invalid registry records including invalid fonts, start-up programs, file paths, device drivers, startup popup windows and invalid software settings. WinASO Registry Optimizer 4.8.6 is a shareware program and can be used as a demo to try the software until the free trial period has ended. A full version of the program is available after the trial period ends. For security reasons, you should also check out the WinASO Registry Optimizer download at LO4D.com which includes virus and malware tests. Additional screenshots of this application download may be available, too. WinASO Registry Optimizer has a presence on social networks.